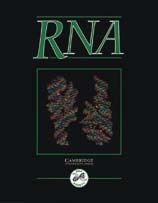 RNA is a monthly journal which provides rapid publication of significant original research in all areas of RNA structure and function in eukaryotic, prokaryotic and viral systems. It covers a broad range of subjects in RNA research, including: structural analysis by biochemical or biophysical means; mRNA structure, function and biogenesis; alternative processing: cis-acting elements and trans-acting factors; ribosome structure and function; translational control; RNA catalysis; tRNA structure, function biogenesis and identity; RNA editing; rRNA structure, function and biogenesis; RNA transport and localization; regulatory RNAs; large and small RNP structure, function and biogenesis; viral RNA metabolism; RNA stability and turnover; in vitro evolution; and RNA chemistry. Its impact factor is 5.046!